Aim: This study aims to investigate the adhesive performance of three different universal adhesives to repair aged composite restorations, with or without the application of silane. Materials and Methods: A hundred and twenty resin composite samples were prepared, aged and randomly divided into 6 main Groups (single bond universal [SBU], All-Bond Universal [ABU], Futurabond U, Clearfil Tri-S Bond, Single Bond 2, and Clearfil SE Bond) and 2 subgroups (with or without silane). A microhybrid composite resin was placed on the aged composite surfaces and light cured. After a micro-shear bonding test, the fracture surfaces were examined under the scanning electron microscopy. Statistical analysis was performed using two-way ANOVA and Tukey's post hoc tests. Results: Among all the universal adhesives, SBU showed the highest bond strength values compared to the other two universal adhesives when used with and without silane (P > 0.05). Between ABU and Futurabond U, no significant difference was observed with silane (P > 0.05) and without silane (P > 0.05). Among conventional adhesives, there was no statistically significant difference (P > 0.05) both with and without silane. Conclusion: Within the limitations of this study, while SBU can be safely used with and without the application of silane, Futurabond U cannot be used without silane. Researchers have reported that additional surface pretreatment procedures were necessary to obtain adequate bond strength with regard to resin materials used in aged composite restorations., They have suggested the possibility of surface treatment of the original composite (OC), including mechanical roughening, acid “etching,” the application of low viscosity bonding agents, “flowable” composites, and silane.,,, Maneenut et al. reported that silane-based adhesives had stronger bond strength than that of adhesives without silane. Clinicians have to keep a range of different materials in their clinics for use in repairing aged composite restorations to ensure adequate bonding strength. This can be expensive. Furthermore, additional application steps are time-consuming for both clinicians and patients. Therefore, manufacturers have introduced multipurpose “universal one-bottle adhesives” for use as either self-etch or etch and rinse adhesives. Perdigao and Loguercio also claimed that these adhesives can be bonded to all kinds of hard tissues or materials. Universal adhesives have similar composition to conventional one-step self-etch adhesives. Most of the adhesives contain specific carboxylate and/or phosphate monomers which bond chemically to calcium in hydroxyapatite. In addition, universal adhesives contain both water and at least, one organic solvent like ethanol or acetone. Universal adhesives are easy to use and provide faster application procedure and less technique-sensitive to clinicians when compared with multi-step adhesives. There is a lack of literature with regard to information on the use of universal adhesives in the repair of composite restorations. For this reason, the aim of this study was to evaluate the adhesive performance of universal adhesives when composite resins were used to repair aged composite restorations. The null hypothesis of the present study was that there is no difference between universal adhesives when used with or without silane with regard to the repair of aged composite restorations. 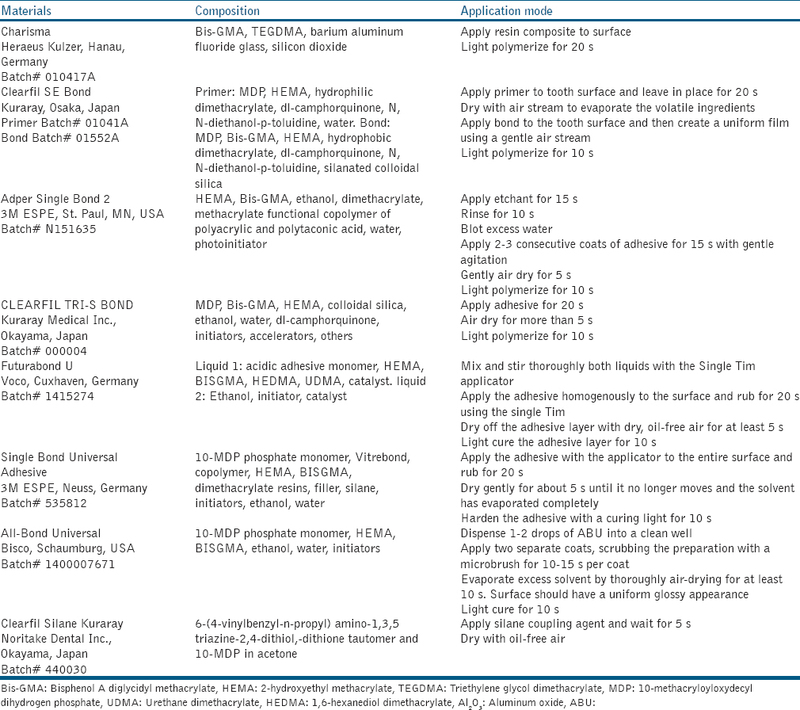 The brand name, manufacturer, chemical composition, and batch number of the materials used in the current study are listed in [Table 1]. A total of 120 composite specimens (Charisma, Heraeus Kulzer) (6 mm diameter × 2 mm thickness) were prepared in plastic molds. The mold was positioned on a glass microscope slide, and the composite resin was injected, a second microscope slide was pressed firmly onto the composite surface to remove the excess, and then light-cured for 20 s using a blue light emitting diode device (LED) (Elipar Free Light III, 3M ESPE ®, St. Paul, MN, USA) at 1200 mW/cm2 output. The intensity of the light-curing unit was controlled throughout the experiment using a radiometer (Demetron LED Radiometer, Kerr Sybron Dental Specialties, Middleton, WI, USA). The samples were polished with a series of aluminum oxide polishing discs (Sof-Lex, 3M ESPE, St Paul, MN, USA) under constant water cooling. After polymerization, the samples were first water-stored at 37°C for 48 h, boiled for 8 h in water, and again water-stored at 37°C for 3 weeks according to the aging method described previously. The surface of all samples was sandblasted with 50 μm Al2O3 (KaVo RONDOflex 2015 Powder; KaVo Dental GmbH, Biberach, Germany) using an intraoral sandblaster (KaVo RONDOflex Plus 360; KaVo Dental GmbH) at a pressure of 2 bars, from a distance of 10 mm for 10 s. For one-half of the groups, silane (Clearfil Ceramic Primer, Kuraray Medical, Inc., Okayama, Japan) was applied to the surface of the aged composites according to the manufacturer's instructions [Table 1]. Group 12: Silane (Kuraray) + CSE (Kuraray). All adhesive procedures were performed at room temperature (24°C) and 70% relative humidity according to manufacturer's instructions as mentioned in [Table 1]. Three cylindrical composite buildups (Charisma, Heraeus Kulzer) were applied to each composite surface (n = 20 on 10 composite discs, placing 2 composite cylinders on each composite disc) using Tygon tubes (0.75 mm internal diameter × 1 mm length) (Tygon, Norton Performance Plastic Co, Cleveland, OH, USA) and bulk-cured for 20 s.
After storage in distilled water (37°C/24 h), the Tygon tubes were removed using a scalpel and the specimens were subjected to a universal testing machine (Instron, Model 4444, Instron Corporation, Canton, MA, USA). A 0.25 mm thick wire loop was placed around the composite cylinders in contact with semi-peripherally. A micro-shear bond test was performed at a crosshead speed of 0.5 mm/min. The micro-shear forces were recorded in Newtons (N) and calculated as megapascals (MPa) dividing by the bonding area (mm2). All fracture surfaces of the debonded samples were coated with gold pallium and examined using scanning electron microscopy (SEM) (LEO-440, Zeiss, Cambridge, England). The failure modes were classified as follows: Adhesive failure (A); at repair composite (RC)-OC interface, cohesive failure in RC; fracture in RC, cohesive failure in OC; fracture in OC, mixed failure (M); a combination of adhesive/cohesive failure. Statistical analysis was undertaken using SPSS 10.0 software (SPSS Inc., Chicago, IL, USA). For each group (Current vs. Universal and silane vs. nonsilane), bond strength data were analyzed using a two-way ANOVA to detect any statistical differences, and multiple comparisons were done using Tukey's post hoc test. Fracture modes were analyzed using the Chi-square test. Pretesting failures were not included in the statistical analysis. [Table 2] shows the mean micro-shear bond strength values of the groups. Among all the silane groups, SBU provided the highest bond strength (49.3 ± 13.7 MPa) followed by CSE (44.4 ± 12.1 MPa) and SB2 (40.2 ± 11.9 MPa), respectively. SBU showed the highest bond strength values compared to the other two universal adhesives when used with and without silane (P > 0.05). Between ABU and Futurabond U no significant difference was observed with (P > 0.05) and without silane (P > 0.05). Among conventional adhesives, there was no statistically significant difference (P > 0.05) both with and without silane. Only the bond strength of Futurabond U increased when used with silane compared to nonsilane groups (21.5 ± 8.1–36.9 ± 11.2 MPa) (P < 0.05). In groups without the use of silane, SBU showed the highest bond strength (47.4 ± 13.0 MPa) followed by SB2 (39.2 ± 11.3 MPa). When SBU was applied without silane, it provided similar bond strength with two conventional adhesives, SB2 and CSE when used with silane (P > 0.05). SEM analysis of debonded surfaces showed that adhesive failure was the most frequently seen type of failure in all groups. Cohesive failure modes were rarely seen in all groups [Figure 1], [Figure 2] and [Table 2]. The Chi-square test showed that there were no statistical differences among all the tested groups in terms of failure modes. Recently, dental manufacturers have introduced multipurpose “universal one-bottle adhesives” for use as either self-etch or as etch and rinse adhesives. These adhesives are claimed by the manufacturers to be suitable for use for all kinds of hard tissue or materials. Since conventional adhesives required time-consuming additional surface procedures to repair fractured composite restorations, the repair protocol of composite restorations, using universal adhesives, may be useful when it comes to increasing the bond strength of composite resins. In the present study, universal adhesives did not improve the bond strength when used without silane. However, a universal adhesive containing silane, SBU increased the bond strength compared to conventional adhesives that were used without silane. When this adhesive was used without silane, it was also found to show higher bond strength than Clearfil TSB with silane and a similar bond strength to both CSE and SB2 that were used with silane. However, the other two silane-free universal adhesives, Futurabond U and ABU, did not increase the bond strength with or without silane. For this reason, the null hypothesis of the present study was rejected. The manufacturers of universal adhesives who have added a silane coupling agent to the adhesives have considered the beneficial effects of the silane coupling agent in restoration repairs., In a recent study, Staxrud and Dahl reported that the application of silane before adhesive procedures, or the use of a silane-containing bonding agent, Scotchbond Universal (known as “SBU” in some countries), increased the bond strength of aged composite resin. Similarly, in the present study, SBU containing silane increased the bond strength. This can be explained by the fact that bifunctional silane molecules adhere to the surface after being hydrolyzed to silanol. Silanol groups form a polysiloxane network on the substrate, which finally reacts with the monomers of the resin composite, and consequently increases bond strength. Phosphate esters such as 10-methacryloyloxydecyl dihydrogen phosphate (10-MDP) found in universal adhesive systems, have many positive attributes, including the potential to bond chemically to metals, zirconia, and tooth tissues through the formation of nonsoluble Calcium salts. However, Futurabond U does not contain 10-MDP. This may be a reason why the bond strength values of Futurabond U were lower than those of SBU and ABU. In the present study, although the addition of silane did not greatly affect the bond strength of two conventional adhesives, TSB and SB2, it increased the bond strength of CSE. Actually, it is expected that two adhesive systems (CSE, TSB) coming from the same manufacturer (Kuraray) with the addition of silane material may have better bond strength than the other adhesive materials used in the present study. However, the silane only increased the bond strength of CSE and did not change the bond strength of Clearfil TSB. This result may be due to the fact that CSE has an additional primer step containing a 10-MDP monomer that can bond chemically to metals. Furthermore, this additional step can increase the wettability of adherent surfaces. Furthermore, according to the manufacturers' instructions, the best procedure for composite repairs is to use a two-step self-etch adhesive system. In the present study, a micro-shear test was used to evaluate the bond strength of the materials tested. This technique has some advantages because it is easy to perform, and does not need samples to be cut after bonding of the composite resin as in “micro-tensile” testing. This means that the bonding strength will not be reduced as a result of the slicing procedure. More than one sample can be bonded to a test surface, therefore, it requires a fewer number of total samples for the study. The SEM examination of a larger number of samples at the same time may be easier than micro-tensile and macro-shear testing. The bonding area is smaller than that of the other shear bond test methods, and this may result in more “adhesive” type failure, and consequently more valid assessment. The “cohesive” fractures do not represent the clinically-relevant failure mechanism that occurs in real cavities. This particular problem can be prevented with micro-shear testing because the predominant failure during the investigation is also one of “adhesive” failure. 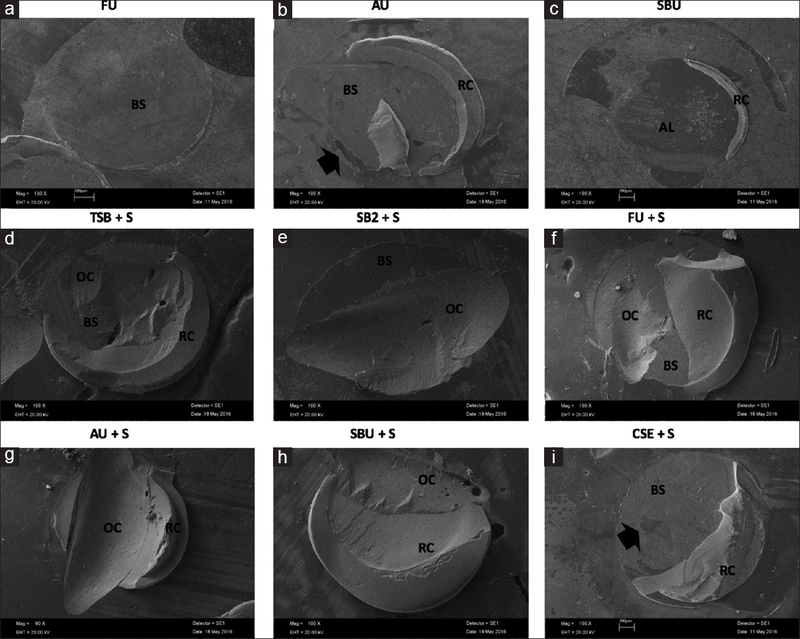 Similarly, in the present study, the SEM images showed that the most common failure type related to the adhesive used. The present study was conducted in an in vitro environment, and several factors such as oral fluids, occlusal forces, and thermal changes were not taken into account, and only composite samples were tested. Therefore, further in vivo and in vitro studies are needed to validate the results of the present study. The effect of universal adhesives on composite repair depends on material selection. A silane-containing universal adhesive, SBU, can be safely used for composite repair, with and without silane. CSE containing silane can also be used in composite repair protocols. Under the tested conditions, the use of the other two universal adhesives is not suitable without silane, because they do not provide higher bond strength than conventional repair methods. Futurabond U cannot be used without silane. Hickel R, Manhart J. Longevity of restorations in posterior teeth and reasons for failure. J Adhes Dent 2001;3:45-64. Moncada G, Fernández E, Martín J, Arancibia C, Mjör IA, Gordan VV, et al. Increasing the longevity of restorations by minimal intervention: A two-year clinical trial. Oper Dent 2008;33:258-64. Bader JD, Shugars DA, Martin JA. Risk indicators for posterior tooth fracture. J Am Dent Assoc 2004;135:883-92. Setcos JC, Khosravi R, Wilson NH, Shen C, Yang M, Mjör IA, et al. Repair or replacement of amalgam restorations: Decisions at a USA and a UK dental school. Oper Dent 2004;29:392-7. Moncada G, Martin J, Fernandez E, Hempel MC, Mjor IA, Gordan VV. Sealing, refurbishment and repair of class I and class II defective restorations: A three-year clinical trial. J Am Dent Assoc 2009;140:425-32. Moncada GC, Martin J, Fernandez E, Vildosola PG, Caamano C, Caro MJ, et al. Alternative treatments for resin-based composite and amalgam restorations with marginal defects: A 12-month clinical trial. Gen Dent 2006;54:314-8. Maneenut C, Sakoolnamarka R, Tyas MJ. The repair potential of resin composite materials. Dent Mater 2011;27:e20-7. Marshall SJ, Bayne SC, Baier R, Tomsia AP, Marshall GW. A review of adhesion science. Dent Mater 2010;26:e11-6. Frankenberger R, Krämer N, Ebert J, Lohbauer U, Käppel S, ten Weges S, et al. Fatigue behavior of the resin-resin bond of partially replaced resin-based composite restorations. Am J Dent 2003;16:17-22. Oztas N, Alaçam A, Bardakçy Y. The effect of air abrasion with two new bonding agents on composite repair. Oper Dent 2003;28:149-54. Papacchini F, Dall'Oca S, Chieffi N, Goracci C, Sadek FT, Suh BI, et al. Composite-to-composite microtensile bond strength in the repair of a microfilled hybrid resin: Effect of surface treatment and oxygen inhibition. J Adhes Dent 2007;9:25-31. Papacchini F, Magni E, Radovic I, Mazzitelli C, Monticellia F, Goracci C, et al. Effect of intermediate agents and pre-heating of repairing resin on composite-repair bonds. Oper Dent 2007;32:363-71. Perdigao J, Loguercio AD. Universal or multi-mode adhesives: Why and how? J Adhes Dent 2014;16:193-4. Yoshida Y, Van Meerbeek B, Nakayama Y, Yoshioka M, Snauwaert J, Abe Y, et al. Adhesion to and decalcification of hydroxyapatite by carboxylic acids. J Dent Res 2001;80:1565-9. Tezvergil A, Lassila LV, Vallittu PK. 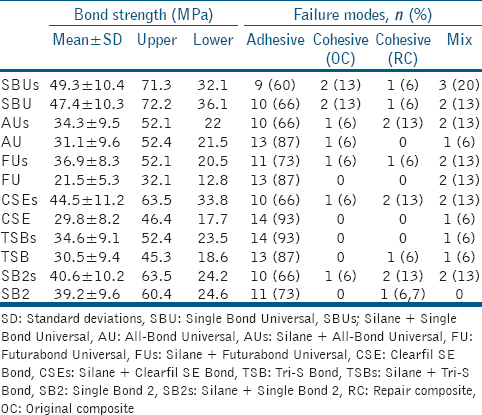 Composite-composite repair bond strength: Effect of different adhesion primers. J Dent 2003;31:521-5. 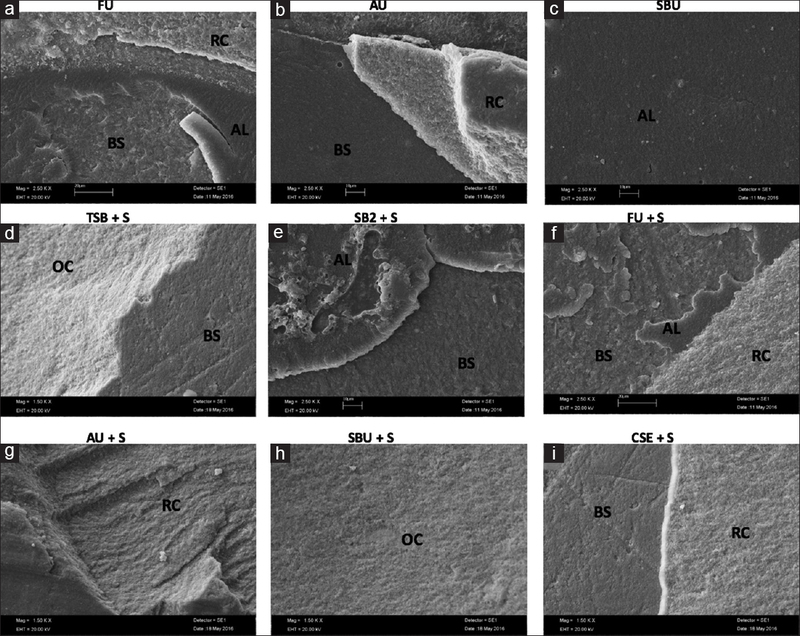 Ozcan M, Schoonbeek G, Gökçe B, Cömlekoglu E, Dündar M. Bond strength comparison of amalgam repair protocols using resin composite in situ ations with and without dentin exposure. Oper Dent 2010;35:655-62. Ozcan M. The use of chairside silica coating for different dental applications: A clinical report. J Prosthet Dent 2002;87:469-472. Staxrud F, Dahl JE. Silanising agents promote resin-composite repair. Int Dent J 2015;65:311-5. Placido E, Meira JB, Lima RG, Muench A, de Souza RM, Ballester RY, et al. Shear versus micro-shear bond strength test: A finite element stress analysis. Dent Mater 2007;23:1086-92.